One thing sellers often ask me about is how to improve their Amazon Best Seller Rank. But before we can discuss a few solutions, we need to have a solid understanding of what the Amazon BSR is and how it functions. Stefan James from Project Life Mastery is stepping in to break down the basics and share some insight. We’ve worked together before and his Amazon success makes him an excellent authority on the subject! What is the difference between Amazon Best Sellers Rank and organic ranking? How can I use Amazon Best Sellers Rank to estimate sales? What tools are available to calculate sales from Amazon Best Sellers Rank? In today’s digital world, there are plenty of ways to make money online. However, in my opinion, Amazon FBA takes the cake. Amazon is the king of e-commerce, and it continues to grow on a massive scale every day. Amazon has become the one-stop shop for the modern-day consumer. In a study published in early 2017, 52% of people said that Amazon is now their first choice for product searches. Not only has Amazon made consumers’ lives a lot easier, but it has also created a lot of opportunities for people to become Amazon sellers and make a lot of money. A lot of people have the desire to sell on Amazon, but when it comes to product research, they don’t even know where to start. Well, I’m here to help! Let’s get started with some of the Amazon basics. I want to show you how just reading an Amazon product page can help you determine how often a product sells on Amazon using a little number that Amazon gives us called the Amazon Best Sellers Rank. Amazon Best Sellers Rank is a number that each and every product in their multi-million product catalog is awarded. The rank itself is based on a number of factors, but first and foremost it represents recent sales volume for a product. In addition, every department on Amazon has its own individual best sellers ranking system, as does each subcategory. Therefore, one product can have an Amazon Best Sellers Rank of 2,000 in Kitchen & Dining while a totally different product can have an Amazon Best Sellers Rank of 2,000 in Toys & Games. Where can I find the Amazon Best Seller Rank for a product? Go to an Amazon.com product page. That’s the page you see when you click on a product after doing a search on Amazon. Next, you will want to scroll down to the product details portion of the page. If you’re on a mobile device, you may need to go to the product description block and click on it. 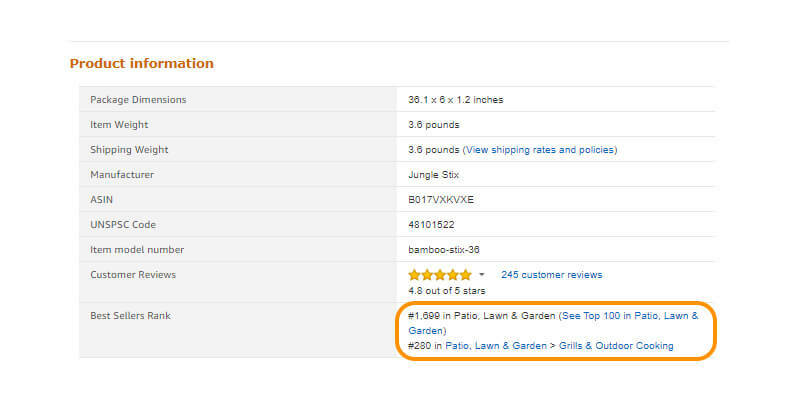 As you can see, the Amazon Best Sellers Rank for Patio, Lawn & Garden department is currently #1,699. Furthermore, it has a Best Sellers Rank of #280 in the sub-category Patio, Lawn & Garden > Grills & Outdoor Cooking. This means that out of the hundreds of thousands of products in Amazon’s Patio, Lawn & Garden department, this particular product is ranked 1,699th. Not too shabby! Everything you see here is currently doing incredible sales on Amazon. You’ll find that a lot of the products on the best sellers pages are usually disposable or consumable products. Also, there’s a lot of seasonal stuff here as well, such as bug traps. In the winter it may be a completely different line-up of products such as Christmas lights, windshield deicer, or snow shovels. What does BSR mean on Amazon? If you’ve ever heard anyone talk about BSR on Amazon, they are referring to the Amazon Best Sellers Rank. That’s all it is! According to Amazon, the Amazon Best Sellers Rank and subsequent lists are a good indicator of how well a product is currently selling on Amazon. It’s updated hourly and it doesn’t only reflect current sales data but historical sales data, as well. For example, if a product has 10 units of sales in one hour but drops to only 1 unit sale the next, that doesn’t mean it will automatically drop down to a BSR that’s for products that only sell one per hour. Let me explain what I mean with an example with some hypothetical numbers. Pretend we have a Product A that’s currently ranked #500 in Amazon’s Patio, Lawn & Garden category. It just sold 8 products in the last hour. At the same time, we have Product B that’s currently ranked #1000 in Amazon’s Patio, Lawn & Garden category. That product sold 4 products in the last hour. In the next hour, Product A sells only 4 products and Product B sells 8 products. Logically, you’d think that the two would swap BSRs, right? In other words, product A would now be BSR #1000 in Patio, Lawn & Garden and Product B would be BSR #500 in Patio, Lawn & Garden. However, Product A‘s Amazon Best Sellers Rank goes to #550. And Product B’s Amazon Best Sellers Rank goes to #950. The reason that the products don’t have drastic fluctuations in their Amazon Best Sellers Rank despite essentially “switching places” with their hourly sales is that Amazon’s Best Sellers Ranking system takes into account the number of historical sales the product had. In the example above, while Product A may have dropped half its hourly sales count, it typically does an average of 8. So even a momentary drop isn’t enough to totally deplete its BSR. What other factors does Amazon consider in its Best Sellers Rank? Recently, some Amazon FBA sellers have noticed that when they offer their products at a discount via a promotion or a coupon, the product’s Best Sellers Ranking does not change as quickly even with high sales volume. While there is no official word from Amazon yet regarding this practice, expert suspect this factor may have been put into place to deter sellers from “gaming” the Best Sellers Ranking system using promotional giveaways to create phony sales velocity. 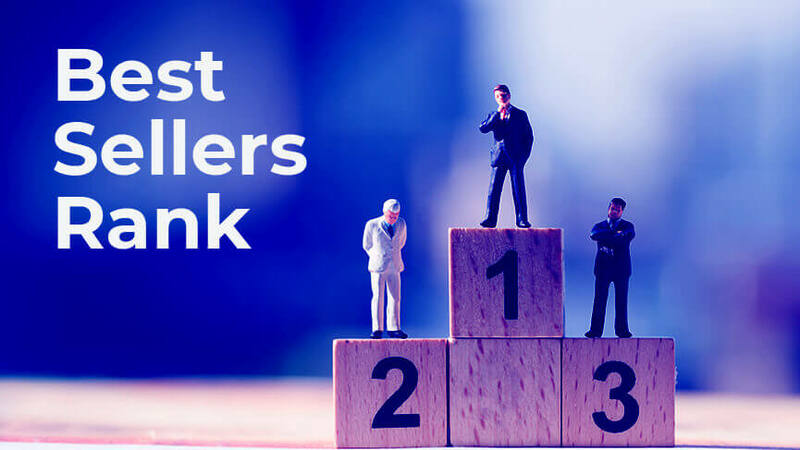 One big thing that a lot of new sellers confuse when they first start selling on Amazon is the difference between Amazon Best Sellers Rank and organic ranking. Hopefully, after reading the information above, you understand what Amazon Best Sellers Rank is. I now want to take a moment to explain what organic ranking is and how the two are very different. What is organic ranking on Amazon? Organic ranking is where a product appears on Amazon’s Search Engine Results Pages (SERP) for a particular keyword. The product’s position on Amazon’s SERP has no bearing on the product’s current Amazon Best Sellers Rank. In fact, the products on the SERP are organized by what Amazon sees as the most relevant products for that search. And the next organic product’s BSR is actually better at #404. Finally, the third organic product’s BSR is still better than the first’s at #914. Pretty wild, right? The reason for this is because Amazon sees the first product as a more relevant result when someone enters in the search term “marshmallow roasting stick” despite it not being the best seller of the bunch. This could be because the product has had better sales in the past, higher rates of conversion, or even better reviews. Don’t mix up Amazon Best Sellers Rank with organic ranking! Both of these values are important, but both have totally different functions. If you seek to create your own product on Amazon as a private label seller, then organic ranking is very important to you. Because the higher your product appears in the SERP, the more likely customers are going to click on it and purchase it. Meanwhile, Amazon Best Sellers Rank is great for estimating the sales frequency of an individual product or an entire product category. By far, the most powerful function of the Amazon Best Sellers Rank–other than just giving you some awesome bragging rights–is using the value to predict how often a product sells on Amazon. Consider this: say we have a product that has a BSR of #1699. And we know from our checking our own sales that a BSR of #1,699 translates to roughly 810 sales per month so long as our Best Sellers Rank stays roughly around that same value. But just a month ago, our average BSR was #3,000 for about 30 days and we only did 510 sales that month. However, last fall, our BSR was #500 on average for 30 days and we did 1,980 sales that month. For starters, we know that if we see another product on Amazon other than ours that has a Best Sellers Rank of #3,000, that product should sell 510 products per month, or close to it. Because that’s what our own product did when its rank was #3,000. And what about a product that’s currently ranked #500? Probably 1,980 sales per month right? Let’s say you have an opportunity to buy these two different books for $0.50 each. The first book is Poor Charlie’s Almanack by Charlie Munger. The book sells for $59.95 on Amazon. Currently, its Amazon Best Sellers Rank in the Books department is #1,942. I know from experience that a book that has a BSR of #1,942 has 540 sales per month. That’s almost a book every hour. This means if you purchase the book and list it on Amazon at the lowest available price, in an hour you will have a sale. Literally that fast! The second book is the old Dungeons & Dragon’s module The Tomb of Horrors. This book sells for more on Amazon at $64.99. So we’d make more profit. But its BSR is #1,256,348. That means this book only sells 2-3 copies per month. If you buy and list this book, chances are you might not see a sale for a month or maybe even longer. So which product sounds better? 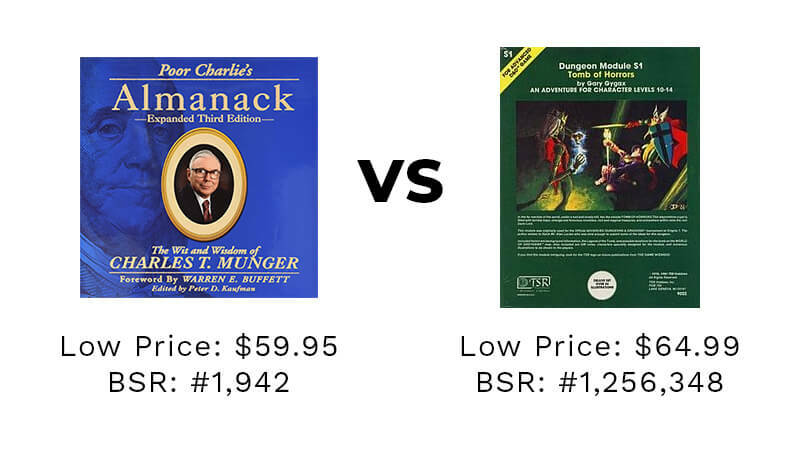 Poor Charlie’s Almanack which is almost guaranteed a sale in its first 24 hours at $59.95, or the Tomb of Horrors which may take months to sell on Amazon at a marginally higher profit? Ultimately that’s your decision, but personally, I’d rather go with Poor Charlie’s Almanack! How to estimate sales for an entire product niche. Okay, so now you understand the basics of how Amazon Best Sellers Rank can help you make the best decision on which products to sell on Amazon. But what if you wanted to create a product that’s never existed before? There’s no way of knowing what its BSR is, right? Fortunately, we can estimate that, too, by taking the average sales for each product on a search results page. We know that products that have a BSR of #1,699 have 810 sales per month. And we know that products that have a BSR of #3,000 have 510 sales per month. Therefore, we can guess that if a product category has about probably 510 – 810 sales per month. I know what you’re thinking! “Stefan, this seems like a lot of work.” And you’re right. It is. Way back when I started selling on Amazon this is how everyone had to do it. Fortunately, easier ways were invented to help you do all this quickly. In fact, you can do all of this in just a few seconds with the right tools. How to calculate product sales using Amazon Best Seller Rank (the EASY way). Back in 2015, estimating Amazon product sales involved a whole lot of homework: spreadsheets, calculators, and a whole lot of guessing and frustration. Fortunately, Greg Mercer of Jungle Scout created a better way. A successful Amazon seller himself, Greg created an application that could take all the information I presented to you above, automatically toss it into a spreadsheet, and immediately calculate a product category’s sales. The average monthly sales for each product on the page. Plus, it gives you the average Amazon Best Sellers Rank, too. If that’s not enough, you’ve also got average sales and review counts. Now, instead of spending hours and hours putting together similar spreadsheets, this program does it all for you in a matter of seconds all at the push of a button. This is the Jungle Scout Chrome Extension and it’s helped hundreds of thousands of sellers all around the world, including me! What tools are available to calculate sales from Amazon Best Seller Rank? First up is the Jungle Scout Chrome Extension which I already demonstrated for you. This powerful application is fed data from Jungle Scout’s AccuSales™ Amazon data science engine. It takes the information on each of Amazon’s Search Engine Result Pages, organizes it, averages it out, and gives you information to help you make the perfect product purchase decision. Jungle Scout FREE sales estimator. If you want to get your feet wet first, then consider trying out Jungle Scout’s FREE sales estimator tool. While it doesn’t estimate the sales for an entire category like the Jungle Scout Chrome Extension, it can make sales estimations simple for you if you prefer to do things the old-fashioned way. Plus, if you want to just get a feel for Amazon and sell only a couple products at first, this might be the best way for you to go. But what if you’re not sure what to sell? That’s where the Jungle Scout Web App can help. This time, instead of finding a product to sell on Amazon using Amazon Best Sellers Rank and random searches, you can put in the Amazon Best Seller Ranks that you’re interested in targeting and reverse engineer a high sales product niche. 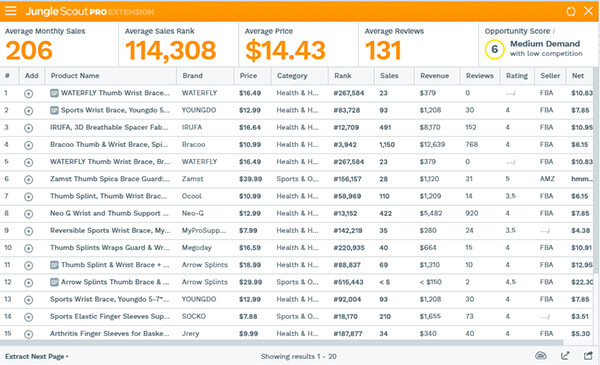 In addition to that, it also has tools to help you track competitor products’ daily sales, find profitable keywords, and organize the Amazon product catalog anyway you see fit. How does Jungle Scout get its data? Since 2015, Jungle Scout’s Amazon sales estimation tool AccuSales™ has processed millions of points of data. Then, Jungle Scout’s team of expert data scientists who have over 30 years of data science (as well as a handful of PhD’s) between them takes that data and creates the world’s most accurate Amazon sales data anywhere. In fact, the only place that has better data than Jungle Scout’s data is Amazon itself! Hopefully, now you have a better understanding of the Amazon Best Sellers Rank and how it can help you estimate product sales on Amazon. Your next step is to either use one of the tools mentioned above to start finding products that can help you get the life you want to live or learn a little bit more about the Amazon sales process. I’ve included a link below that can teach you all about How to Sell on Amazon FBA. Stefan James is a internet entrepreneur, life and business coach, philanthropist, and world traveler. You can learn more about his awesome story at Project Life Mastery.